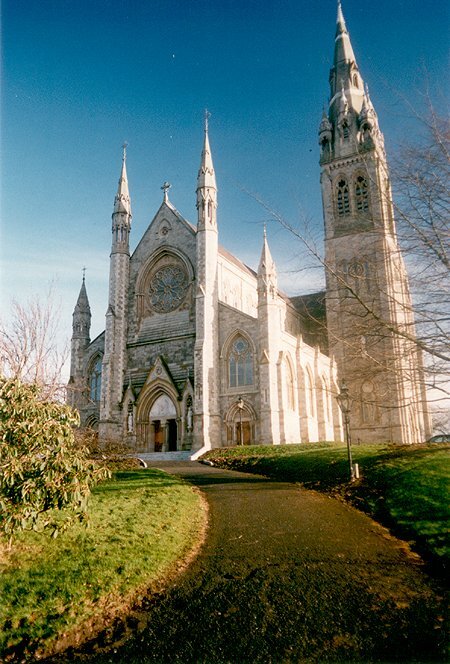 St Macartan’s Cathedral was constructed between 1861 and 1891 and is the most impressive of J.J McCarthy’s cathedrals – McCarthy was known as the Irish pugin due to his great enthusiasm for gothic architecture. 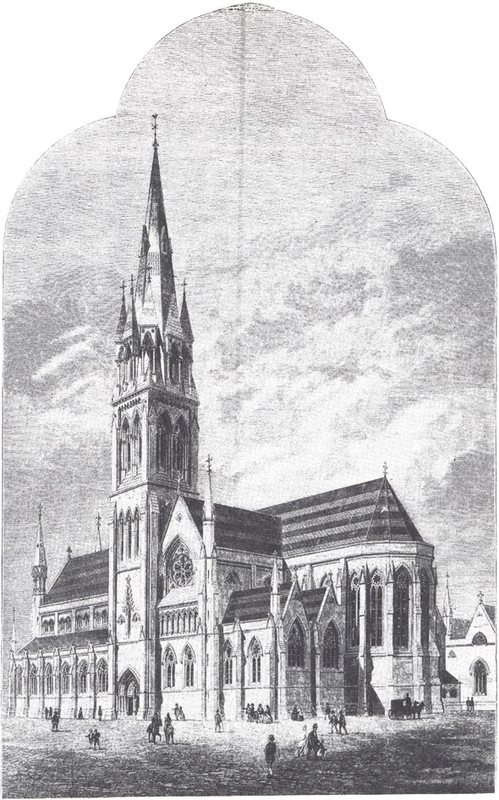 After McCarthy’s death, the building was continued by William Hague who remained true to the design. 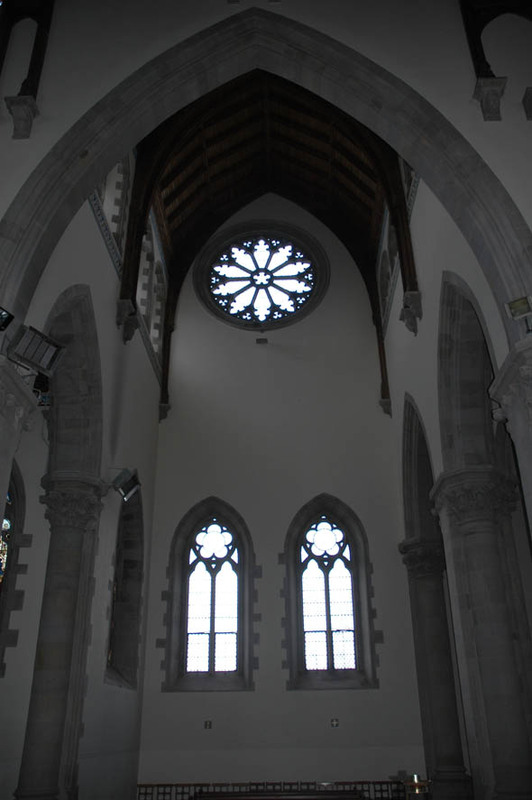 Originally the nave was intended to be 2 bays longer but lack of funds meant that the design was cut back. 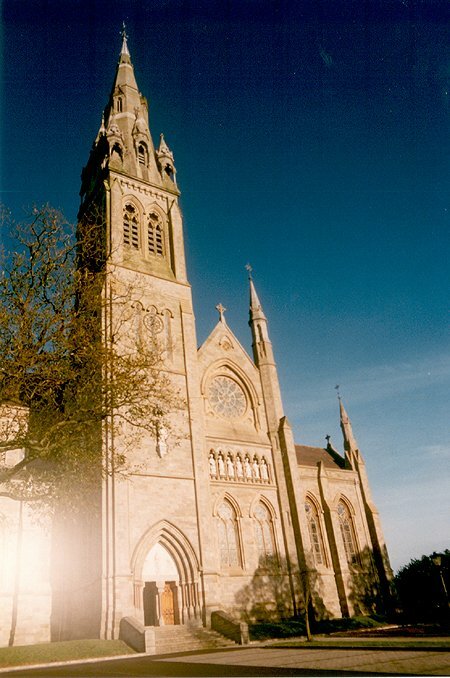 The silhouette of the building is dramatic with its slim spires at the west end and transepts while the cathedral’s spire dominates the area at over 240 feet tall with its ornate Victorian gothic decoration and limestone. 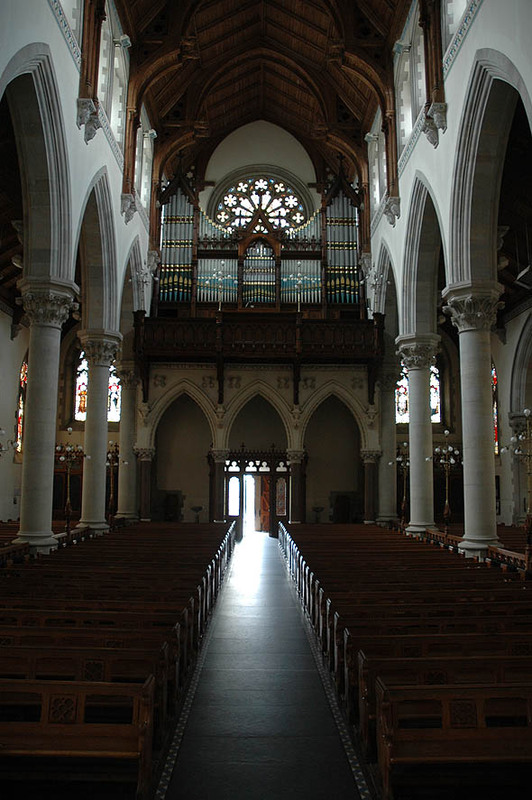 The Cathedral also has a dramatic soaring interior. 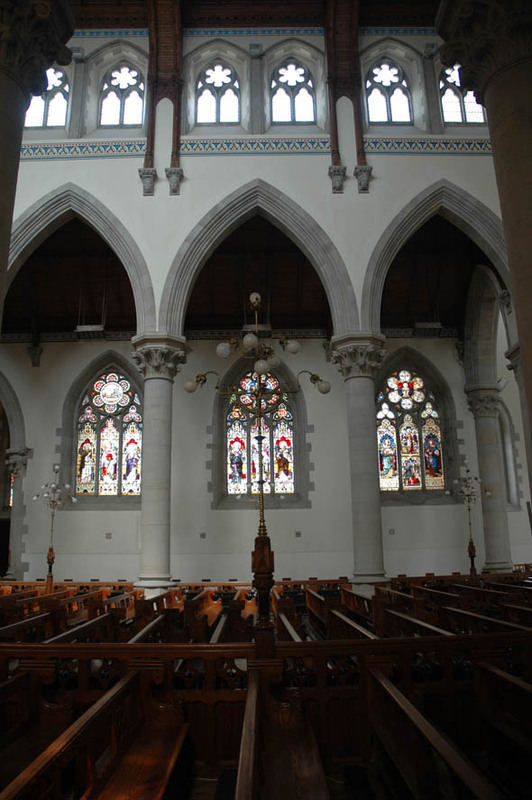 St Macartan’s Cathedral has a very ornate exterior with three large rose windows with elaborate tracery in addition to its soaring spire. 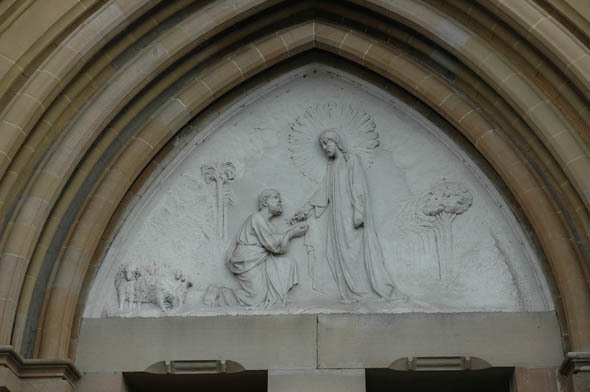 The exterior of the cathedral is decorated with Italian statuary of saints and bishops set in stone arcaded niches at the end of the transepts. 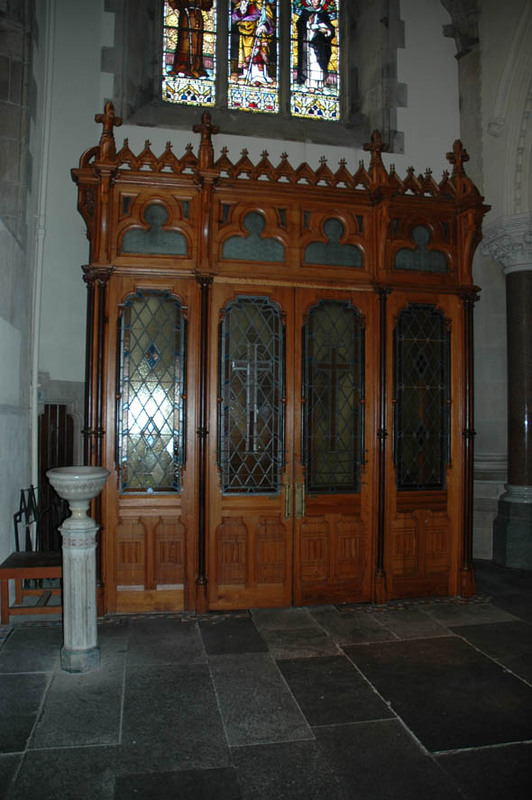 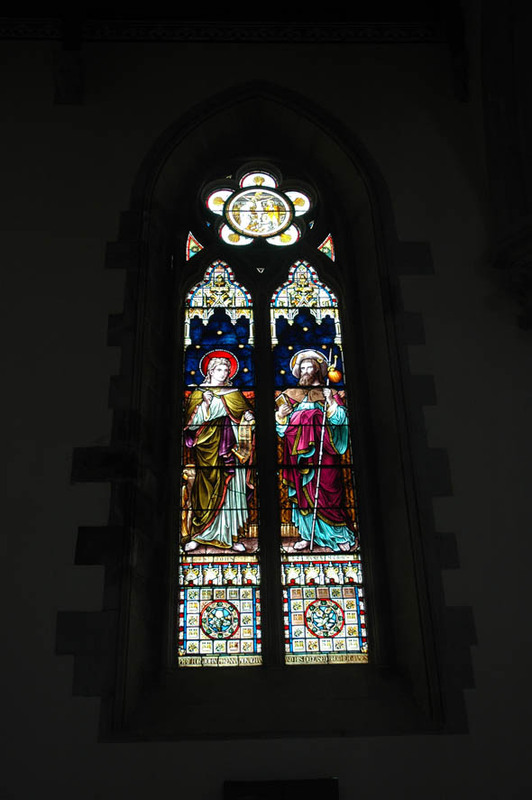 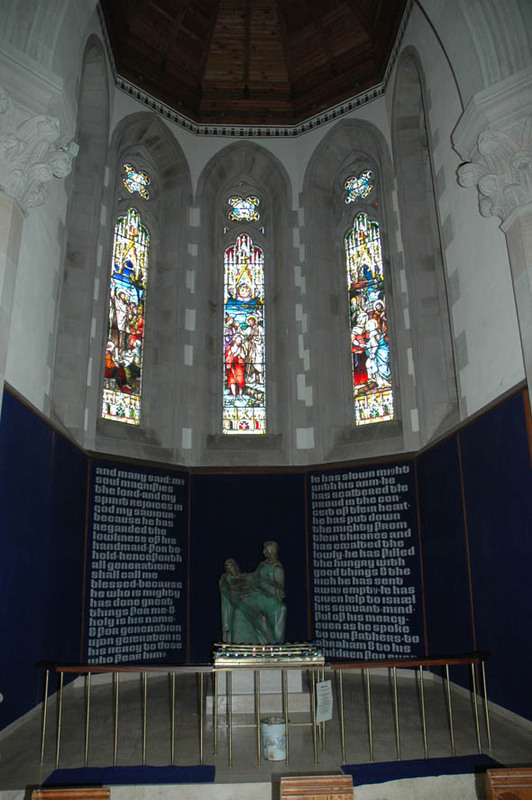 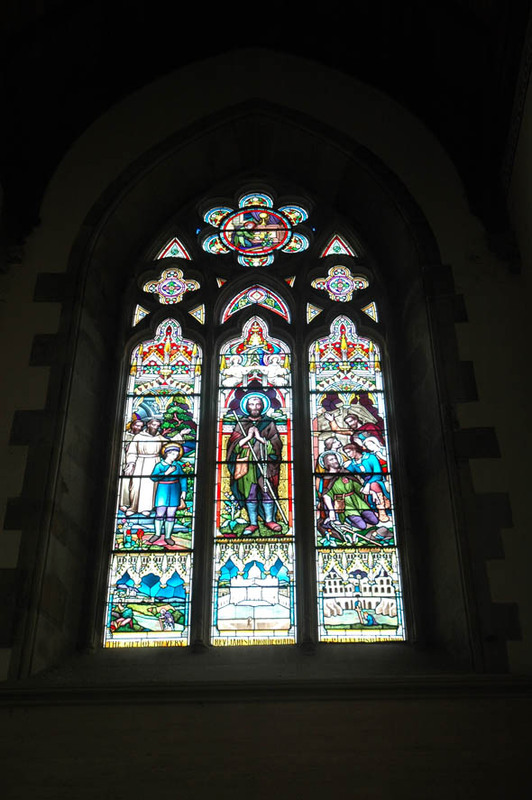 The statues were carved in Italy of Carrera marble and depict local saints and notable Bishops of Clogher including the Bishop responsible for the building – Bishop Donnelly who is depicted with a model of the church. 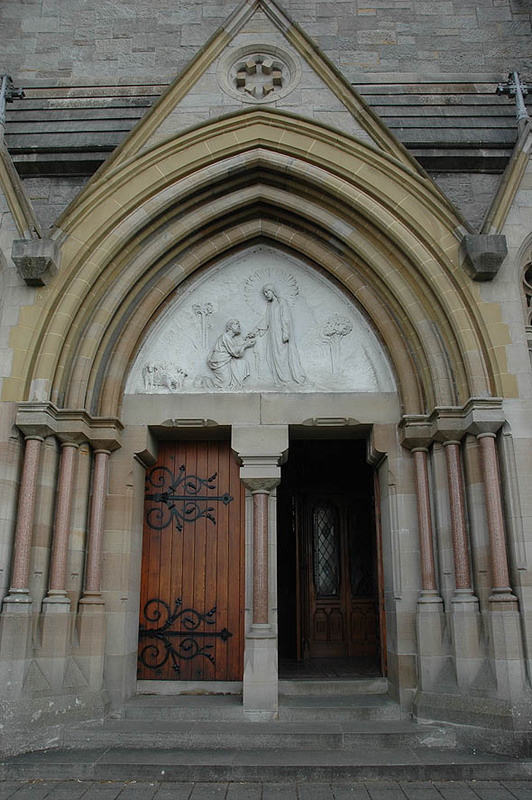 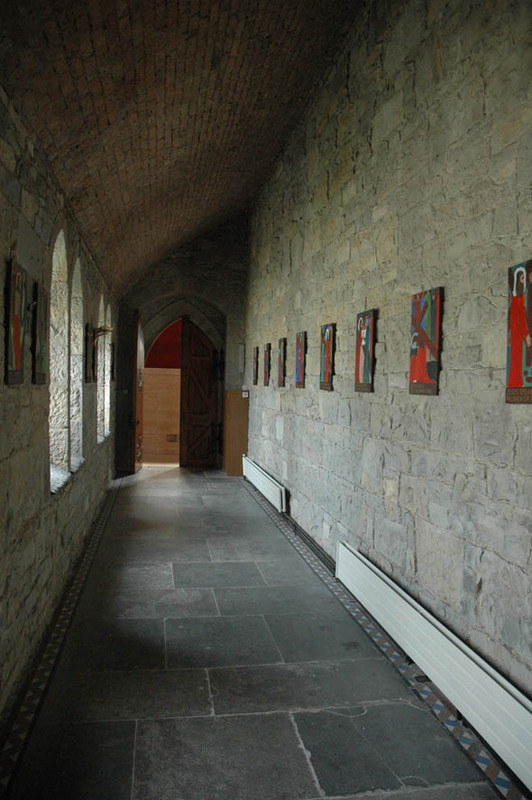 Over the two main doorways are carved panels depicting scenes from the New Testament. 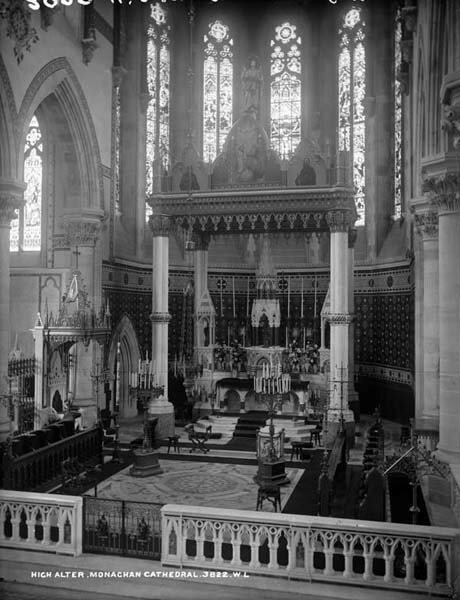 The cathedral sanctuary was largely destroyed by the local Bishop in a misguided attempt to modernise inline with Vatican II. 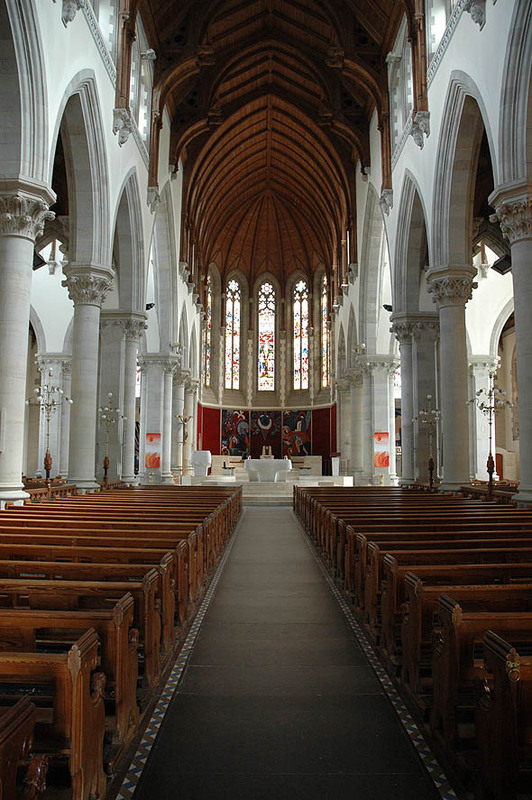 There are little original fittings left apart from some lighting standards and pews. 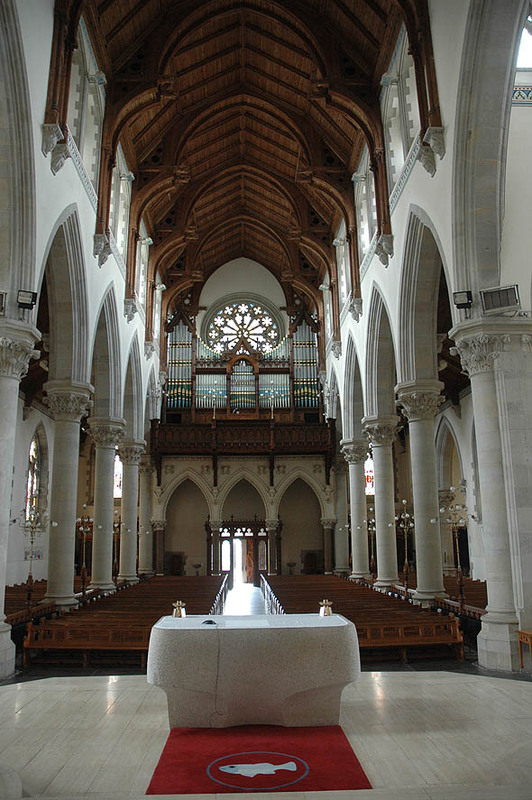 The crowning glory of the interior of St Macartan’s Cathedral is the magnificent wooden hammerbeam roof which like the main part of the nave remains intact.This elaborate roof is supported on carved corbels depicting saints placed between the clerestory windows. 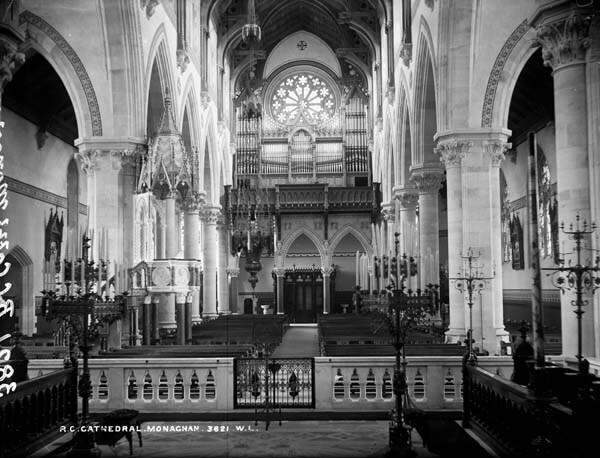 Most of the original fittings were destroyed during a renovation in the 1980s with unsuitable modern alternatives installed. 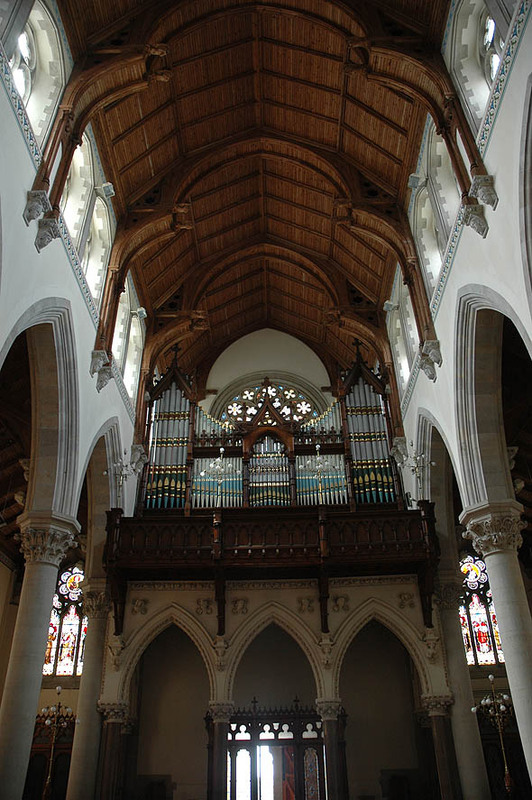 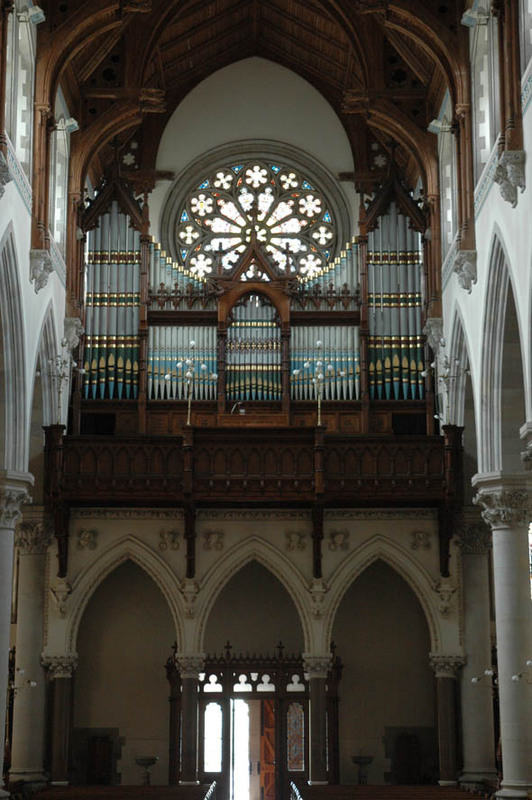 One of the remaining pieces in the west end organ loft with its magnificent Telford Organ in front of the rose window. 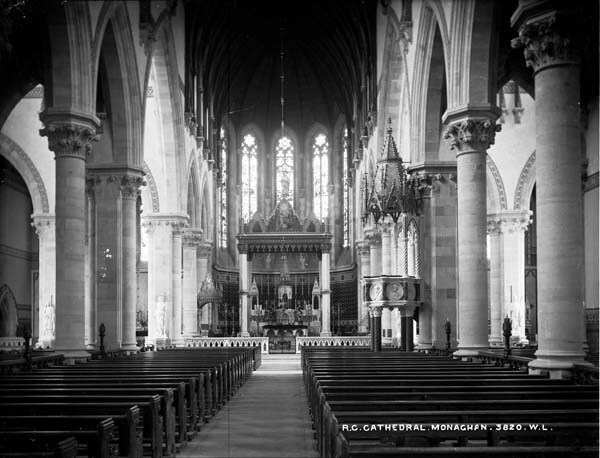 All of the massive columns separated in the nave and aisles have carved capitals and the wooden railings between them has original brass light fittings and mounts. 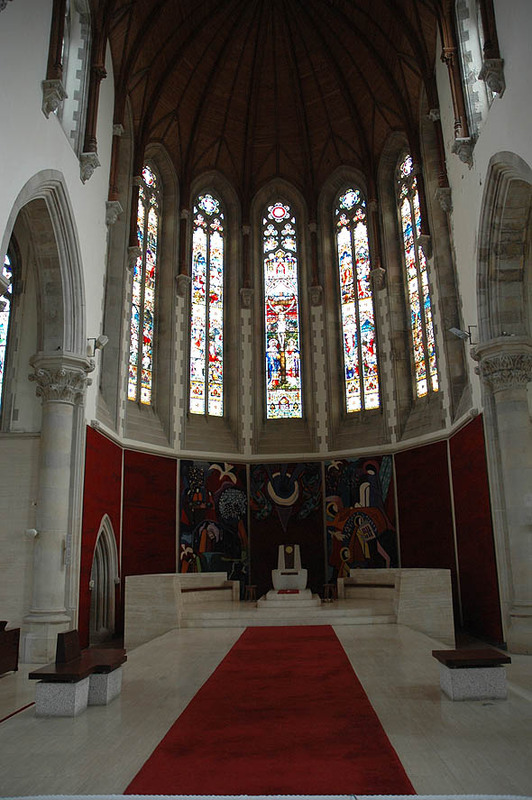 The chancel is flanked by four side altars of 2 bays length. 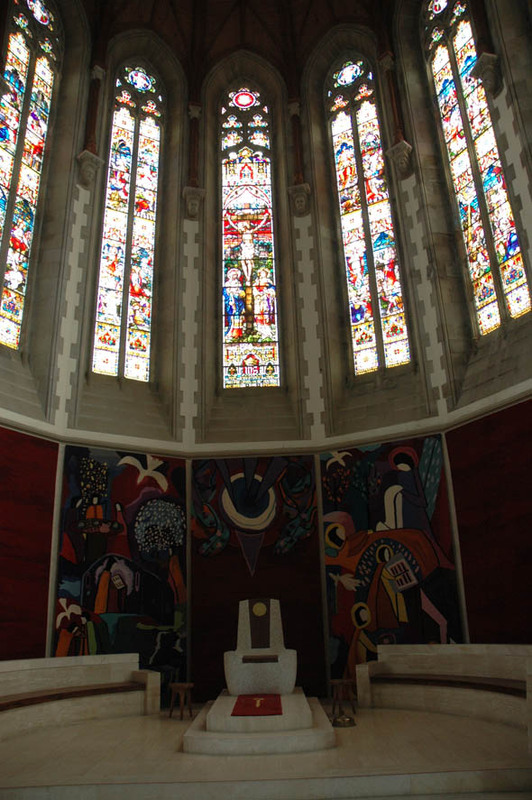 The apse is polygonal (as is the baptistry) and lit by tall lancet windows. 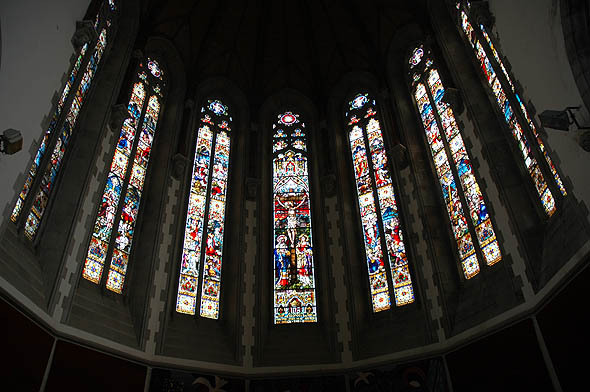 With the exception of the rose windows in the transepts, all the windows contain stained glass by Meyer.